Danny Elfman was born on May 29, 1953 in Los Angeles, California to a Jewish family from Poland and Russia. He is the son of Blossom Elfman (née Bernstein), a writer and teacher, and Milton Elfman, a teacher who was in the Air Force. He was raised in a racially mixed affluent community in Baldwin Hills, California. He spent much of his time in the neighborhood's local movie theater, adoring the music of such film composers as Bernard Herrmann and Franz Waxman. Stating that he hung out with the "band geeks" in high school, he started a ska band. After dropping out of high school, he followed his brother Richard to France, where he performed with Le Grand Magic Circus, an avant-garde musical theater group. He was never officially a student at the CalArts, but an instructor there encouraged him to continue learning. Elfman stated, "He just laughed, and said, 'Sit. Play.' I continued to sit and play for a couple years." At this time, his brother Richard was forming a new musical theater group. In 1972 Richard Elfman founded the American new wave band/performance art group, originally called The Mystic Knights of the Oingo Boingo. They played several shows throughout the 1970s until Richard Elfman left the band to become a filmmaker. As a send-off to the band's original concept, Richard Elfman created the film Forbidden Zone based on their stage performances. 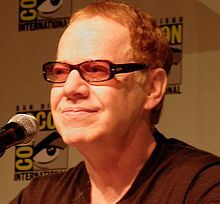 Danny Elfman composed his first score for the film and played the role of Satan (the other band members played his minions). By the time the movie was completed, they had taken the name Oingo Boingo and begun recording and touring as a rock group. From 1976 and on, it was led by Danny Elfman, until 1995 when they suddenly retired. The semi-theatrical music and comedy troupe had transformed into a ska-influenced new wave band in 1979, and then changed again towards a more guitar-oriented rock sound, in the late 1980s.. Oingo Boingo, still led by Danny Elfman, performed as themselves in the 1986 movie Back to School. Additionally, Danny Elfman and Oingo Boingo guitarist Steve Bartek reunited on October 31, 2015 to perform the song "Dead Man's Party" – "for the first time in 20 years to the day", as Elfman said to the audience – during an encore at a Halloween celebration at the Hollywood Bowl. In 1985, Tim Burton and Paul Reubens invited Elfman to write the score for their first feature film, Pee-wee's Big Adventure. Elfman was apprehensive at first, because of his lack of formal training, but with orchestration assistance from Oingo Boingo guitarist and arranger Steve Bartek, he achieved his goal of emulating the mood of such composers as Nino Rota and Bernard Herrmann. In the booklet for the first volume of Music for a Darkened Theatre, Elfman described the first time he heard his music played by a full orchestra as one of the most thrilling experiences of his life. Elfman immediately developed a rapport with Burton and has gone on to score all but three of Burton's major studio releases: Ed Wood, which was under production while Elfman and Burton were having a serious disagreement, Sweeney Todd and, most recently, Miss Peregrine's Home for Peculiar Children. Elfman also provided the singing voice for Jack Skellington in Tim Burton's The Nightmare Before Christmas and the voices of both Barrel and the "Clown with the Tear-Away Face". In 1990, Elfman composed the iconic orchestra piece, "Ice Dance", for the Tim Burton film Edward Scissorhands. Years later he provided the voice for Bonejangles the skeleton in Corpse Bride and the voices of the Oompa-Loompas in Charlie and the Chocolate Factory. One of Elfman's notable compositions is The Simpsons theme, which he wrote in 1989. In 2002 Elfman composed the soundtracks for the Sam Raimi Spider-Man series, except for Spider-Man 3, to which he contributed a variety of work on the soundtrack, but did not compose the soundtrack. In October 2013, Elfman returned to the stage to sing his vocal parts to a handful of Nightmare Before Christmas songs as part of a concert titled Danny Elfman's Music from the Films of Tim Burton. He composed the film score for Oz the Great and Powerful (2013), and composed additional music for Avengers: Age of Ultron (2015) together with Brian Tyler. Elfman composed the score for all three of the Fifty Shades films (2015–2018). Elfman's film scores were featured in the 2017 production SCORE: A Film Music Documentary. Also that year, he took over the place of composer in the DCEU's Justice League and was able to reprise parts of his own score from Tim Burton's 1989 Batman for the new incarnation of the character. In 2004 Elfman composed Serenada Schizophrana for the American Composers Orchestra. It was conducted by John Mauceri on its recording and by Steven Sloane at its premiere at Carnegie Hall in New York City on February 23, 2005. After its premiere, it was recorded in studio and released onto SACD on October 3, 2006. The meeting with Mauceri proved fruitful as the composer was encouraged then to write a new concert piece for Mauceri and the Hollywood Bowl Orchestra. Elfman composed an "overture to a non-existent musical" and called the piece "The Overeager Overture". 2017 saw the premiere of his 40-minute Concerto for Violin & Orchestra ('Eleven Eleven') in Prague, with soloist Sandy Cameron (for whom it was written) and conducted by John Mauceri with the Czech National Symphony Orchestra. It was jointly commissioned by Prague Proms, Stanford Symphony and the Royal Scottish National Orchestra and has subsequently been performed in Germany and the US, with further dates planned. A 4-movement, 21-minute Piano Quartet was premiered by the Berlin Philharmonic Piano Quartet as part of their US tour in 2018. The Violin Concerto and Piano Quartet were released on a Sony Classical recording in 2019. Elfman continues to compose his film scores in addition to these other projects. In November 2010, it was reported that Danny Elfman was writing the music for a planned musical based on the life of Harry Houdini, but, as of January 2012[update], he was no longer attached to the project. In 2011 Elfman composed the music for the Cirque du Soleil show Iris, which was performed at the Dolby Theatre in Hollywood from July 21, 2011 to January 19, 2013. In October 2016, Elfman composed a horror score for when Donald Trump "loom[ed]" behind Hillary Clinton at the second United States presidential election debates, 2016. The style of Elfman's music has been influenced by modern composers including Béla Bartók, Philip Glass, Lou Harrison, Carl Orff, Harry Partch, Sergei Prokofiev, Maurice Ravel, Erik Satie, Igor Stravinsky, as well as Romantic composer Pyotr Ilyich Tchaikovsky. Elfman has said that the first time he noticed film music was when he heard Bernard Herrmann's score to The Day the Earth Stood Still as an eleven-year-old; afterwards he became a fan of film music. Elfman's influences in film music include the work of Erich Wolfgang Korngold, Max Steiner, David Tamkin, Franz Waxman, and Nino Rota, who served as a significant influence and the main inspiration for Elfman's score for Pee-wee's Big Adventure. Elfman's work in pop music was influenced by The Specials, Madness, the Selecter, and XTC. As a teenager, Elfman dated his classmate Kim Gordon, who would later become one of the members of the rock band Sonic Youth. On November 29, 2003, Elfman married actress Bridget Fonda. They have a son, Oliver. In 1998, Elfman scored A Simple Plan, starring Fonda. He is the uncle of actor Bodhi Elfman, who is married to actress Jenna Elfman. Elfman has been an atheist since the age of 11 or 12. According to him, he is a cynicologist. Describing his politics during the 1980s, Elfman said, "I'm not a doomist. My attitude is always to be critical of what's around you, but not ever to forget how lucky we are. I've traveled around the world. I left thinking I was a revolutionary. I came back real right-wing patriotic. Since then, I've kind of mellowed in between." In 2008, he expressed support for Barack Obama and said that Sarah Palin was his "worst nightmare". During the 18 years with Oingo Boingo, Elfman developed significant hearing damage as a result of the continuous exposure to the high noise levels involved in performing in a rock band. Afraid of worsening his condition, he decided to leave the band, saying that he would never return to that kind of performance. His impairment was so bad that he could not "even sit in a loud restaurant or bar anymore." However, he found performing in front of orchestras more tolerable, and returned several times to reprise his live performance of Jack Skellington. Elfman's scores for Batman and Edward Scissorhands were nominated for AFI's 100 Years of Film Scores. ^ "Oingo Boingo". AllMusic. Retrieved December 26, 2016. ^ Denman-Underhill, Lori (October 22, 2015). "Overcoming Stage Fright, Danny Elfman Brings Nightmare to the Bowl". LA Weekly. Retrieved December 26, 2016. ^ Braheny, John (1990). "Interview: Danny Elfman". Blunt Instrument. Retrieved February 2, 2013. ^ "Batman (1989) Awards, IMDB.com". Retrieved September 27, 2012. ^ "Composer Danny Elfman Scores First Emmy Award". Broadcast Music, Inc. September 21, 2005. Retrieved December 26, 2016. ^ "Top Film, TV, Cable Composers Honored at BMI's Annual Film/TV Awards". Broadcast Music, Inc. May 14, 2002. Retrieved October 28, 2010. ^ "Daniel Robert Elfman - California, Birth Index". FamilySearch. Retrieved December 24, 2014. ^ "Interview: Danny Elfman". The Jewish Chronicle. March 4, 2010. Archived from the original on March 10, 2010. Retrieved August 26, 2014. ^ Sean O'Neal (October 27, 2014). "Danny Elfman on Oingo Boingo, film scores, and the Beatles almost ruining Batman". AV Music. Retrieved March 4, 2018. ^ "Danny Elfman profile". Film Reference. Retrieved January 2, 2011. ^ M. Glionna, John (April 18, 1999). "Danny Elfman Pinged From Oingo Boingo Front Man to Prolific Movie Score Writer. Now This Oddball May Pong Into Directing His Own Scripts". Los Angeles Times. Retrieved December 26, 2016. ^ "Oingo Boingo - The Complete History". Buzzine. May 7, 2009. Archived from the original on January 16, 2010. Retrieved January 2, 2011. ^ Vaughn, Chelle (April 4, 1996). "Danny Elfman". Video Entertainment Magazine. Boingo. Retrieved January 2, 2011. ^ "Composed #2 – Danny Elfman". Cinetropolis. 26 August 2013. ^ Romano, Nick (November 1, 2015). "Danny Elfman: 'Dead Man's Party' performed after 20 years". Entertainment Weekly. Retrieved December 26, 2016. ^ a b Silber, Frederic (1989). "Danny Elfman: Wunderkind of Filmmusic". Fanfare. Boingo. Retrieved January 2, 2011. ^ Ng, David (September 18, 2013). "Danny Elfman concert of Tim Burton film music adds third performance". Los Angeles Times. Retrieved October 10, 2013. ^ "Danny Elfman's Music from the Films of Tim Burton". BBC Concert Orchestra. Archived from the original on December 30, 2013. Retrieved October 10, 2013. ^ Goodman, Jessica (January 21, 2017). "See the star-studded tracklist for Fifty Shades Darker soundtrack". Entertainment Weekly. Retrieved February 19, 2017. ^ "Danny Elfman Hates When Reboots Scrap Classic Themes". The Hollywood Reporter. Retrieved 2018-11-15. ^ "Danny Elfman Reveals His 'Best Accomplishment' in Justice League". ScreenRant. 2017-11-26. Retrieved 2018-11-15. ^ Vozick-Levinson, Simon (November 2, 2010). "Aaron Sorkin writing Hugh Jackman's Houdini musical: Composer Danny Elfman has 'high hopes'". Entertainment Weekly. Archived from the original on November 5, 2010. Retrieved December 4, 2010. ^ Potts, Kimberly (January 4, 2012). "Hugh Jackman, Aaron Sorkin Teaming for 'Houdini' Musical". The Wrap. Retrieved December 26, 2016. ^ "Iris". Cirque du Soleil. Retrieved April 8, 2014. ^ Bowe, Miles (October 14, 2016). "Danny Elfman composed a horror score for Donald Trump's awful debate performance". FACT. Retrieved October 14, 2016. ^ Canfield, David (October 14, 2016). "Danny Elfman Wrote a Horror Movie Score Specifically For the Footage of Trump Looming Over Hillary". Slate. Retrieved October 14, 2016. ^ a b Lustig, Jessica (2005). "So Danny Elfman Walks into Carnegie Hall..." American Composers. Retrieved May 7, 2012. ^ a b Florino, Rick (December 14, 2010). "Danny Elfman Talks Tim Burton Scores, Bernard Hermann's Influence and More". ARTIST direct. Retrieved May 7, 2012. ^ Halfyard, Janet. Danny Elfman's Batman: A Film Score Guide. Scarecrow Press. p. 6. ISBN 978-0810851269. ^ Friedman, Ann (February 5, 2015). "Even Kim Gordon Doesn't Have It All". The New Republic. Retrieved March 9, 2017. ^ M. Silverman, Stephen (December 4, 2003). "PASSAGES: Bridget Fonda's Boingo Wedding". People. Retrieved March 9, 2017. ^ Carpenter, Cassie (June 5, 2015). "Bridget Fonda and husband Danny Elfman drop $3.6M on four-bedroom time capsule in LA's historic Fremont Place". Daily Mail Online. Retrieved March 9, 2017. ^ Maslin, Janet (December 11, 1998). "FILM REVIEW; A Frozen Setting Frames a Chilling Tale". The New York Times. Retrieved March 9, 2017. ^ a b Phull, Hardeep (July 4, 2015). "How 'Batman' almost broke composer Danny Elfman". New York Post. Archived from the original on July 5, 2015. Retrieved March 9, 2017. ^ Stambler, Irwin (1989). Encyclopedia of Pop, Rock and Soul (Rev. ed.). New York: St. Martin's Press. pp. 495–497. ISBN 0312025734. ^ Elfman, Danny (October 30, 2008). "Battling Our Greatest Fear". The Huffington Post. Retrieved December 26, 2016. ^ Denman-Underhill, Lori (October 22, 2015). "Overcoming Stage Fright, Danny Elfman Brings Nightmare to the Bowl". L.A. Weekly. Archived from the original on October 22, 2015. Retrieved March 9, 2017. ^ Parker, Lyndsey (December 24, 2014). "A Danny Elfman Q&A: From Boingo to Burton". Yahoo!. Archived from the original on March 9, 2017. Retrieved 9 March 2017. ^ Ng, David (September 5, 2016). "'Nightmare Before Christmas' and Danny Elfman returning to Hollywood Bowl for 2016 Hallowee". Los Angeles Times. Archived from the original on September 5, 2016. Retrieved March 9, 2017. Wikimedia Commons has media related to Danny Elfman.